The day has finally arrived. Many long days and nights and even more changes. But the story has survived and the characters are ready to tell it. I am out of words at the moment and I’ll let the book do what it was meant to do. Reblogs, shares and those witty reviews are most welcome. And thanks for staying with me through all my posts that have led us all here today. Corporal Sam Deland has a lot on his plate. He’s a dog lover, single dad, jet pilot, likes girls and his tight knit state police squad is buried under the weight of an unsolved brutal double murder that has stunned his quiet upstate community. 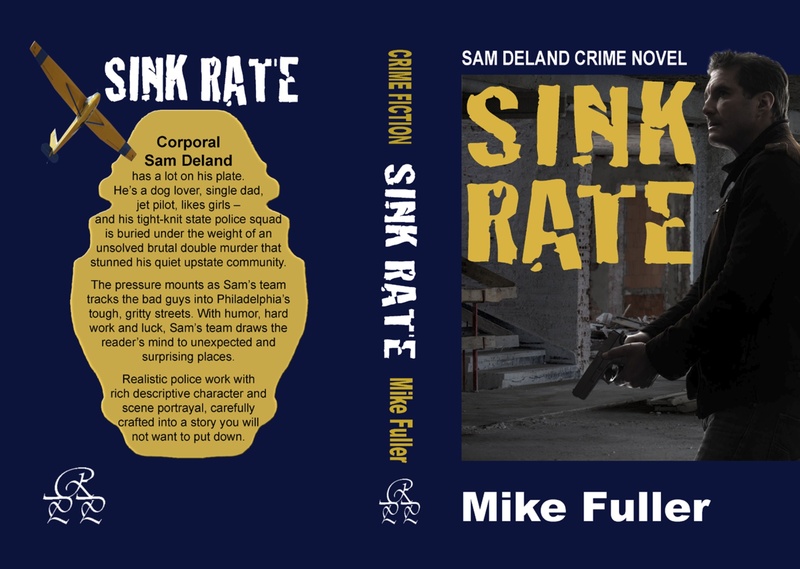 The pressure mounts as Sam’s team tracks the bad guys into Philadelphia’s tough, gritty streets. The characters are the real story though and with humor, hard work and luck Sam’s team draws the reader’s mind to unexpected and surprising places. Realistic police work with a rich descriptive character and scene portrayal is carefully crafted into a story that will be hard to put down. This entry was posted in Author, book release, crime, crime fiction, detective fiction, fiction, law enforcement, murder, mystery, novel, police, publishing, SINK RATE, suspense, thriller, writing and tagged author, book release, crime, crime fiction, detective fiction, fiction, law enforcement, murder, mystery, novel, police, publishing, SINK RATE, suspense, thriller, Writing. Bookmark the permalink. Very happy. But back to work on the next book. Well. Already onto the next one? Actually it is #5. A sequel to my historical novel, CAPTAIN’S CROSS. Awesome! Congratulations, can’t wait to read it! Thanks. There are several scenes set in Bucks County. You will recognize some of them. It was not planned but the time of year the action takes place exactly matches. That’s very cool! Bought it on Amazon last night! Congratulations Mike! Picked up my copy today.